The green leafy vegetable known as kale has recently become very popular as a “superfood.” Despite it’s newfound popularity, there are also a great number of people who are less than fond of kale and seldom (if ever) eat it. Perhaps that is because they have never experienced how tasty kale can be when properly prepared or when it is featured in the right recipes. One thing is for sure, people who shy away from it are missing out on the numerous health benefits of kale. Kale is a member of the cruciferous vegetable family which is renowned for its many healthy compounds and outstanding health benefits, not least of which is their ability to fight and prevent cancer. Other members of this “royal” vegetable family include arugula, bok choy, broccoli, Brussels sprouts, cabbage, cauliflower, mustard greens, radish, turnip, and watercress. Until the end of the Middle Ages, Kale was one of the most common green vegetables in Europe. Russian kale was introduced into the United States in the 19th century by Russian traders after they first introduced it to Canada. Cultivation of kale was encouraged in the United Kingdom during World War II by the Dig for Victory campaign because it was easy to grow and it provided important nutrients which were often missing due to food rationing. Today, kale appears on many superfoods lists, and with good reason. It is highly nutritious, containing high levels of vitamins, minerals, and brain-boosting and health-enhancing phytonutrients. Kale is also one of the easiest crops to grow in home gardens and by local farmers − thriving in small plots of land and personal gardens. Kale is especially high in vitamins K, A, and C. It contains more than 1,000 percent of the recommended daily intake of vitamin K, 98 percent of vitamin A, and 71 percent of vitamin C (more than an orange). Kale is also a great source of calcium, magnesium, iron, and antioxidants. It contains abundant antioxidants which help remove free radicals from the body which can lead to accelerated aging as well as cancer and other serious diseases. It only takes 100 calories of kale to provide over 350 milligrams for the most basic omega-3 fatty acid (alpha-linolenic acid, or ALA). Kale provides comprehensive support for the body’s detoxification system. New research has shown that the isothiocyanates (ITCs) made from kale’s glucosinolates can help regulate detox at the cellular level. Kale has a good balance of the omega-3 and omega-6 fatty acids, which is essential for heart health. Kale is also a good source of the mineral potassium, another must for heart health. Vitamin K is also associated with heart health because it is an essential factor in blood clotting and lack of it can cause hemorrhages. In addition, lack of vitamin K may cause mechanisms that stop the formation of blood vessel calcification to become inactive. Kale helps manage diabetes in a number of ways. Kale’s sulfur content aids with diabetes because of its role in detoxification as well as the production of glutathione, one of the body’s most important antioxidants. Sulfur is also extremely important for glucose metabolism, helping to decrease weight gain and the risk of diabetes. One study found that kale contained more glucoraphanin, the precursor to sulfur, than broccoli. One cup of cooked kale contains 10% of daily fiber needs. Increased fiber can reduce blood glucose levels shown in the standard fasting blood glucose test (a test of blood sugar levels after an overnight fast). Increased fiber also decreases glycated haemoglobin (HbA1c) levels. These levels indicate when proteins in the blood mix with blood sugar, and are associated with increased risk of diabetes complications. Kale has at least 45 different flavonoids, which may reduce the risk of stroke. It also contains significant iron, which helps in the formation of hemoglobin, the main carrier of oxygen to cells of the body, including the brain. The omega-3 fatty acids are also important for brain memory, performance, and behavioral function. The compound sulforaphane which is found in kale has anti-inflammatory properties that may help cognitive function, especially after an injury to the brain. The high fiber content of kale helps lower cholesterol levels because it picks up excess cholesterol compounds in the gut and pushes them out in the elimination process. Research has found that the fiber in steamed kale binds better to bile in the digestive tract, resulting in greater removal of cholesterol. Kale is listed as one of the “good-for-your-bones foods” by the National Osteoporosis Foundation because of its calcium content. One cup of cooked kale has about the same amount of calcium as one cup of cow’s milk. Sulfur helps in removing toxins from the skin, boosts the production of collagen (which keeps skin looking youthful), and aids in wound healing and reduces scarring. Kale’s vitamin C is also necessary for collagen production. Vitamin A, a compound in retinoids, is popular in anti-aging skin treatments. The iron in Kale may help prevent hair loss because iron deficiencies can cause hair loss. With just 33 calories per cup, kale is a popular diet food. As a source of magnesium − which is one of the minerals that most people are deficient in − kale supports the body in maintaining optimum digestion as well as manage stress. Kale is an exceptional food for lowering risk of chronic inflammation. Many of the compounds in kale, such as vitamin K, are key nutrients for helping regulate the body’s inflammatory process. Inflammation often plays a key role in the development of cancer, particularly chronic inflammation. Kale is a very good source of the antioxidants lutein, beta-carotene, kaempferol, and quercetin − all of which are associated with cancer prevention and treatment benefits. Like other members of the cruciferous vegetable family, kale is rich in sulfur-containing compounds called glucosinolates which support detoxification, and indole-3-carbinol which greatly reduces the risk of breast, colon, and lung cancer. Research suggests that kale may be most helpful in protecting against bladder, breast, colon, ovary, and prostate cancers. A study published in the journal Molecular Cancer found that that sulforaphane glucosinolate stopped growth in epithelial ovarian cancer cells. Numerous other studies have been performed on kale which show cancer preventive benefits from kale intake, and in some cases, treatment benefits as well. Kale’s cancer preventive benefits have been clearly linked to its high concentration of two types of antioxidants − carotenoids and flavonoids. Within the carotenoids, lutein and beta-carotene stand out. Lutein and beta-carotene are key nutrients for protecting the body from oxidative stress. The most prominent of kale’s may different flavonoids are the flavonols, including kaempferol, quercetin, and isorhamnetin. The glucosinolates found in kale are utilized for DNA repair and help prevent cancer and slow the growth of cancer cells. Are Precautions About Kale Necessary? Because kale contains oxalate, a naturally-occurring substance found in food (including leafy vegetables), you may hear cautions that eating kale could cause kidney stones. High oxalate levels can increase the concentration of calcium or oxalate in urine, causing kidney stones to form. Pay little mind to such warnings because kale, unlike many other leafy vegetables, has a very low oxalate level. That means that the calcium and iron found in kale are highly digestible. Note: If you eat other leafy vegetables which are higher in oxalate levels, you can minimize the risks by chewing well and relaxing between meals − healthy habits we all should all be doing anyway. 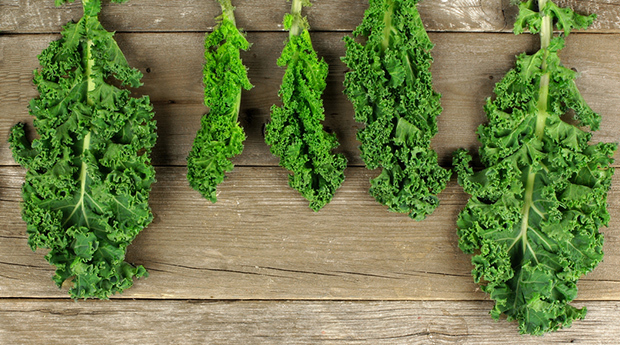 After the New York Times published an opinion piece in January of 2014 about possible connections between kale (and other cruciferous vegetables) and thyroid problems, kale has come under suspicion for being goitrogenic – the term used for a substance that could cause swelling or dysfunction of the thyroid gland. However, recent studies have shown that kale and other cruciferous vegetables do not interfere with thyroid function in healthy people. According to an article in The Permanente Journal, even people with hypothyroidism can eat as much kale as they want if it is cooked. One real risk with kale is pesticide consumption. The Environmental Working Group listed kale on its Dirty Dozen Plus list of most contaminated foods in 2014 and 2015. As a result, it is highly recommended that you choose organic kale when possible, and be sure to wash what you buy thoroughly. A simple and inexpensive food wash can be accomplished by letting produce items soak for up to half an hour in a large bowl of water with an added cup of white vinegar. Hydrogen peroxide can be substituted for the vinegar. Some people spray a combination of white vinegar and hydrogen peroxide on produce and then rinse well with running water. You’ll be more inclined to enjoy the outstanding health benefits of kale if you prepare and cook it properly. Cutting kale leaves into 1/2″ slices and the stems into 1/4″ lengths and then steaming for 5 minutes helps ensure quick and even cooking. Some believe that there are potential health benefits from letting the stems and slices sit for about 5 minutes prior to cooking. There are many ways to incorporate kale into your diet. You can massage it with a bit of olive oil and sea salt for the base of a green salad, blend it into smoothies, soups, or sauces, sauté it with other vegetables in a stir-fry, bake it into frittatas, lasagnas, or burgers − and even make it into kale chips. The bottom line is: don’t count kale out too quickly. It is simply too healthy to pass up – and if you get creative with how you prepare and combine it in recipes you might find that you like kale after all! Are you a fan of kale? If so, what are your favorite ways to eat it? Please share in the Comments section below. Kale has recently become very popular as a “superfood.” Despite it’s newfound popularity, there are also many people who never eat it and are missing out on the numerous health benefits of kale. Kale is a member of the cruciferous vegetable family which has many known health benefits including the ability to fight and prevent cancer. Other members of this family include arugula, bok choy, broccoli, Brussels sprouts, cabbage, cauliflower, mustard greens, radish, turnip, and watercress. Kale is one of the easiest crops to grow in home gardens and by local farmers and thrives in small plots of land. Kale is especially high in vitamins K, A, and C. It is also a great source of calcium, magnesium, iron, and antioxidants. Research suggests that kale may be most helpful in protecting against bladder, breast, colon, ovary, and prostate cancers. Numerous studies have been performed on kale which show cancer preventive benefits from kale intake, and in some cases, treatment benefits as well. Kale, unlike many other leafy vegetables, has a very low oxalate level which means that the calcium and iron found in kale are highly digestible and unlikely to cause kidney stones. Recent studies have also shown that kale and other cruciferous vegetables do not interfere with thyroid function in healthy people.